Baby E has been outgrowing so much of her clothing, we were really excited when Zulily offered to send her a holiday outfit for review! It's one of our favorite places to shop because while she mostly wears hand-me-downs, when we do purchase something we have a limited budget but want high quality. That's where Zulily comes in, I can always find a good deal there on high quality clothing and top brand names that I otherwise wouldn't be able to purchase. Baby E received a Nicole Miller holiday dress, Corky and Company coat, as well as a headband, tights, and Rampage shoes. I'll let the photos do the talking, and Baby E too of course, she said "I look like a princess in this outfit!" Well yes you do, though you're my princess no matter what you wear. I had to put some limits on when she wears it though because she proposed "Mommy, I want to wear this every day, can I?" She was really excited about the coat and I was excited she'll be able to wear it for a few seasons. She now wears the adorable shoes every day, even though she still needs to grow into them! Baby E loves the headband! It will look great with many of her outfits. My favorite thing about Zulily is getting the surprise daily deals in my inbox every day! You never know what deal you'll find. I love the constant variety of brands for baby, kids, home, and myself. I also like that they last a few days so I can make a decision thoughtfully and not purchase on impulse. Every purchase I've made there has been a hit, from our chicken roaster and stainless butter dish, to the few items I got for Baby E for a great price. Did you know you can also refer friends and get $15 when they make their first purchase? 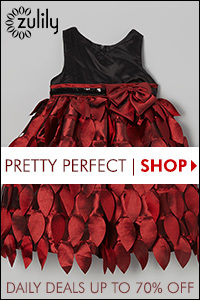 Another reason to shop at Zulily besides the obvious deals? It's so easy to find what you want with their search feature, shop by size, shop by category, and the option to see the deals that end that day. Every time I see a brand I really like, but do not want to purchase at that time, I just click the heart to mark it as a favorite - that way I get notified the day before that brand is featured again. Love that feature! Oh I love that coat. Clothes are so expensive but with my daughter being my last baby I so enjoy buying her the cute little outfits. Zulily makes that possible. Thank you for the review. She is adorable.